Current measurements of gross domestic product offer an incomplete account of the components of the digital economy. The economy businesses and citizens are experiencing, increasingly driven by digital technology and measured by Big Data, is largely absent from the conventional measure of how the economy is performing, Gross Domestic Product. A new approach to the statistics is needed to paint an accurate picture of the economy for policymakers. The 1885 Abstract of Statistics for the United Kingdom was published at the height of the Industrial Revolution, but you would never guess it from the information that was gathered about the economy. A dozen pages covered the factories, mines and railways. Ten times as many gave exhaustive detail on agricultural output and trade. Statistics always lag behind what is actually happening in the economy. Not only does it take time to gather and collate the data, it can also take many years to understand how to think about the economy at a time of major structural change, whether in the late 19th century or today. Gross Domestic Product (GDP) is the concept we use for understanding and measuring economic progress. It is discussed every day in the media, and for banks and businesses, as shorthand for how the economy is doing. Above all, it shapes the debate about economic policy. Increasingly, there is an awareness that GDP is not an entirely satisfactory measure, as it does not give policymakers an accurate picture of how the economy is changing. The economy that businesses and citizens are experiencing, driven by Big Data and “software eating the world,” is largely absent from official statistics. GDP is not a natural object but a concept, compiled in an extraordinarily complicated manner from thousands of data series from many sources. The U.S. Department of Commerce Bureau of Economic Analysis (BEA) described it as “one of the greatest inventions of the 20th century.” It was devised during World War II, defined to best enable the efficient use of all available resources for the war effort. The concept of “the economy” as an entity was new, for questions of national wealth and progress had been debated in different ways during previous decades. We are once again experiencing significant structural economic change, and above all are the changes to business organization, trade, and innovation arising from digital technologies and their consequences. The statistics are struggling to keep up. To give an idea of the scale of the measurement challenge, imagine that the GDP figure just omitted all of the investment in machinery and commercial buildings and factories by American businesses—about $1.5 trillion in 2014. That is how much Federal Reserve economists estimated was left out by the failure to include in GDP business investment in “intangible” capital, such as software, brand equity, and R&D. This situation is just starting to change, with new definitions introduced in 2013 adding 3% to the size of the American economy overnight. [i] But there is no doubt that official statistics still fail to capture much of the digital economy, as investment in “intangibles” now exceeds investment in physical capital equipment and structures. Including a complete assessment of the increasingly important components of the digital economy would have a profound impact on how we understand economic growth. There are in fact four significant problems with GDP: how to measure innovation; the explosion of free online services; the shift away from mass production to customization andvariety; and the increase in specialization and extended production chains, especially across national borders. None of these will be solved by a quick fix, but at least being aware of them will help us interpret today’s economic statistics. Yet, measured GDP underestimates the benefits of innovation. Some innovations represent incremental improvements to existing goods, although even these can be compelling to consumers. For example, DuPont sold 800,000 pairs of nylons on the first day they went on sale on May 15, 1940, and the company sold 64 million pairs in a year. Others innovations, however, bring about step changes in human wellbeing. The economic historian David Landes recounts how Nathan Mayer Rothschild died of an infected tooth abscess in 1836. [i] What might the richest man in the world at the time have paid for an antibiotic, if only they had been invented? Economists call the gap between market price paid (which is used to calculate GDP statistics) and what someone would willingly have paid for a product consumer surplus. It is potentially high for new goods and services. By definition, consumer surplus is not included in GDP, which adds up output measured at market prices. At times of rapid innovation, there can potentially be a large amount of consumer benefit not being captured in the statistics. Statisticians do aim to account for innovative goods by deflating dollar values with price indices adjusted for rapid improvements in quality or attributes; these are known as hedonic prices. The Boskin Commission in 1996 concluded U.S. real GDP growth had been underestimated by about 1.3 percentage points a year because of a failure to make this kind of adjustment for innovation in consumer electronic goods, notably computers. Deflating nominal GDP to get real growth using hedonic price indices has become standard practice since then. Still, it is not likely that this kind of technique can ever fully capture the impact of innovations that are radically new. When one estimate has the price of a unit of computer power (millions of instructions per second) declining at least 1.7 trillion-fold, no price index or real GDP measure will ever be able to incorporate it. It is a qualitative change. Nor can hedonic indices ever capture quality changes that are more a matter of judgement than definable and quantifiable characteristics, which includes not only many services but also intangible goods such as software or entertainment products. Hal Varian, Google’s chief economist, has specifically argued that GDP cannot measure some “sharing economy” innovations because of their character. The consumer benefit of a matching platform like Uber or Airbnb consists partly of standard gains (such as lower prices due to competition) and partly of pure efficiency gain (such as less waiting time or a better fit to individual requirements). GDP captures only some of the benefits. Economists have always known that GDP does not measure innovation well and fails to incorporate consumer surplus. However, the problem can often be ignored as GDP growth will remain a useful indicator as long as the pace of innovation is roughly constant—but not at times when innovation is particularly rapid or radical. of medical research. One possible explanation is simply that it takes time for innovations to diffuse across the economy, so the statistics will show the effect when people are finally using the new products. [iii] Although there is great variability between firms and between countries, however, the speed of diffusion is extremely rapid with many of the new digital technologies. The more likely explanation is that the sceptical economists are of course looking at GDP data. If GDP statistics do not capture the innovations, they will by definition not give a complete picture. There is much debate at present about just how large consumer surplus due to innovations might be. At the optimistic end, one U.S. study estimated that free websites generated a consumer surplus for 2007-2011 equivalent to 0.75% of GDP a year, and a European study (using data up to 2011) estimated their benefit at 0.6% to 1% of GDP a year. Other economists challenge these large estimates, arguing that much of the digital economy is captured elsewhere in GDP, including in broadband subscriptions and the value of online advertising. While that is correct, it is not plausible that the statistics capture the step changes in quality of life brought about by all of the new technologies, any more than the price of an antibiotic captures the value of life. This debate highlights a specific challenge the technology-driven changes in the economy pose for GDP statistics. That is the “problem” of “free.” As GDP measures expenditure on goods and services at market prices, something with a zero price is not included. We are of course awash with free services online, all creating value for their users: Google, Wikipedia, open source software, news and entertainment sites without paywalls, blogs that compete with magazines or journals, music and films and podcasts (not all of it pirated), and so on. In the case of free goods, the consumer surplus “wedge” in excess of GDP is obviously at a maximum. How could statisticians begin to measure something with no price and no sales revenue attached? There is an important caveat—revenues might simply have been redistributed around the economy. People using free online services are paying their broadband or cell phone providers and paying for electricity. Advertisers are paying the online companies. These are earning revenues selling data about their users back to advertisers. Employment in traditional newspapers has declined but more people are working for smaller firms in the digital economy. It is not clear what the net effect on sales or on wages and employment has been. In a 2012 report, Michael Mandel estimated that the “app economy” had created nearly 500,000 jobs in the American economy since 2007, largely below the radar due to the smaller scale of the firms involved. On the other hand, a recent study of the value of advertising-supported, free-to-consumers online entertainment estimated that incorporating this would raise real GDP growth only by a small fraction of 1% per year. [iv] Nor do we know to what extent in some cases “free” is a temporary stage until business models evolve. Even so, the cornucopia of free online activities will remain, delivering some consumer value. Can this be reflected in GDP statistics? There are already several categories in GDP for which statisticians have to devise prices because there is no market price. The obvious example is government expenditure, where often the wage paid to government employees is used, or the price of a similar private sector service. Some “informal economy” activities that are not marketed are also included, especially in developing countries where households often produce significant amounts of food and clothing for their own use (although notoriously everyday housework and caring for dependents is excluded). Finally, statisticians will “impute” prices to some services that are not paid for, notably the value of living in owner-occupied housing. Again, market rents provide the price measures used. At present there is no momentum for official statisticians to try to incorporate the “free” digital economy into GDP statistics. This remains just one more question mark over what we actually learn from current GDP statistics. A third piece of the statistical puzzle is the huge variety of products and services available in the U.S. economy. Its origins in wartime planning and subsequent prime use for economic management mean GDP is not concerned with the mix of products or expenditure—just the total. In a mass production economy, this was not a big drawback. As long as the number of cars rolling off the lines could be counted accurately, what type they were was relatively unimportant. Yet, GDP puts the same value on three spoons as it does on a knife, fork and spoon; the same value on two left shoes as it does a matched pair of shoes. The greater the variety of products and services being purchased, the less well GDP reflects the consumer benefits. Some social scientists argue that too much choice imposes a psychological cost on consumers. The “paradox of choice” finds that the wider the choice of items people are given, the less happy they are and the less likely they are to choose anything. [v] However, what might be true at individual level does not carry over to aggregate measures, as people are all different. Even if I am better off when faced with a choice of only four types of jelly, not ten, there is no reason why you would want to select from the same four types as me. For the nation as a hole, the explosion of variety is a clear consumer benefit. Digital technologies have already unbundled albums packaged by the recording industry. If anything, this will have reduced measured GDP because the recording industry has lost revenues, while the consumer gains are unrecorded. What will the scale of the uncounted value be as 3D printing or personalized medicine come to the mass market? This too will be a further wedge between GDP and the wellbeing or economic welfare of the population. A final area where conventional economic statistics struggle to keep track with profound changes in the economy is the significant changes in the structure of production during the past 25 years or so. Enabled by a combination of digital technologies and deregulation (including trade agreements), firms are increasingly links in long chains of specialized contributors to final products—and increasingly, services. These often are located in several countries, and this reorganization of production is one aspect of globalization. There are fewer large corporate hierarchies producing much of what they need to create the final product in-house, and more networks of firms are linked to each other in complicated relationships. The reshaping of the global economy into increasingly specialized units has been the source of great leaps in efficiency, as well as the rapid economic growth in countries like China and Brazil. Indeed, research by Professors Ricardo Hausman and Cesar Hidalgo shows a strong link between the extent to which a country is part of the global production web and its prosperity. [vi] Economic complexity—a measure of both the variety of products and services in the economy and the degree to which producers are linked to others—is highly correlated with output per head. The extent to which the economy is structured as a network of specialized producers is a key indicator of prosperity. 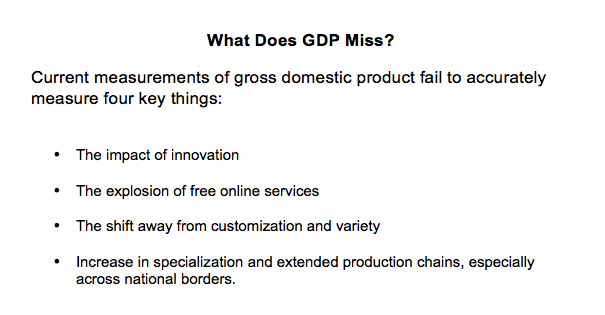 These significant areas of difficulty with the GDP statistics do raise the question of what their purpose is now. 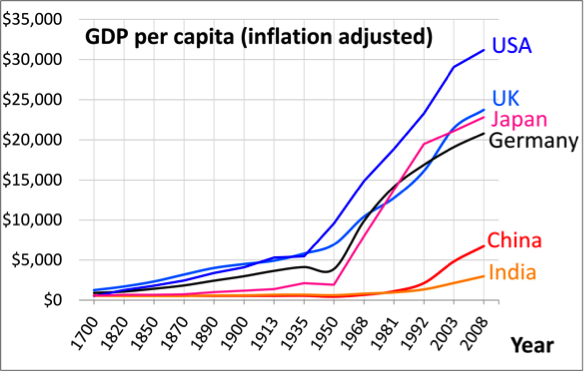 The recent changes in the economy have in fact revived the 1930s debate that pre-dated the wartime creation of GDP. Simon Kuznets—often described as the father of GDP because he did so much of the preliminary statistical research—was strongly opposed to the measure that became GDP because it was a tool for tracking output but not economic welfare. He argued for an economic welfare measure but lost the debate because of the wartime imperatives and the later use of GDP for the macroeconomic policies of demand management. Should we measure what is created outside the market, such as work in the home, voluntary activities, contributing to Wikipedia or open source software, writing free blogs, etc. Should the distribution of income be a key statistic? How should the statistics account for the nation’s balance sheet in terms of financial, physical, human, and natural capital? These are ultimately questions about the purpose of GDP. [viii] Is it a measure of economic welfare by which citizens can hold their policymakers to account? Is it simply a tool to help the Fed and the Treasury set macroeconomic policy? Is it an administrative device for benchmarking national performance (as in the EU’s Maastricht criteria, which set budget deficit limits as ratios to GDP, or the World Bank’s league tables of national performance)? If it is a welfare measure, GDP is doing a decreasingly effective job, but there has been too little research by economists into what ought to replace it. A number of “dashboard” alternatives exist—as recommended by an influential 2009 commission of experts—but these consist of eclectic lists of indicators reflecting the interests of their originators, and there is no consensus about what to include. If it is simply a macroeconomic or policy tool, GDP has become far too complex. In central banks and treasuries around the world, there is unease about making decisions affecting businesses and households on the basis of such a highly judgemental and significantly revised statistic. It is alarming to consider that Greece’s future hangs on the estimates of the ratio of its debt to its GDP, given how much uncertainty there is about this latter figure. How much scope there is for innovation in the collection of statistics is an obvious question. To what extent can the data revolution simply make conventional GDP (and other) statistics redundant? Already there are projects (such as MIT’s Billion Prices project) or commercial equivalents that scrape websites and/or gather user-generated information. Search engines, social media, and cell phone data will in time become more useful as a source of economic information. For many purposes, this will be a faster and simpler source of information about the economy. Official statisticians ought to be asking themselves about the extent to which they can go digital in their data gathering and construction. However, Big Data also holds serious challenges. Statisticians are careful to ensure they collect data from a sample that matches the overall population; with Big Data, the sample is rarely considered and often self-selected (for example, depending on who uses a certain website or search engine). In some cases, the data generated will be biased by the structure of algorithms or because the context is commercial rather than in answer to an official survey. One important consideration is the legal framework for making datasets available. Official statisticians already do not have access to most commercial databases (such as the scanning data from stores) or if they do, it must be purchased. In any democracy, it would be difficult to countenance having policy rely on statistics owned by commercial entities with no obligation to share their collection methods or statistical processes, and no right for government agencies to share the information with the public. There would need to be debate about the appropriate legal framework before Big Data generated by search engines or social media could be used for any official policy purposes. It is hard to imagine that economic statistics will be unaffected by the data revolution, but these kinds of issues could prove difficult to resolve. Almost since its birth, GDP has had vocal critics. Some environmental campaigners were proposing alternatives as early as the 1970s. Yet, for the most part, it has served as an unchallenged headline measure of economic progress around the world for more than 70 years. This is changing, and the swelling chorus of criticism is sounding from different quarters. The reason is without doubt the fact that the economy, nationally and internationally, has been changing so substantially that GDP is an increasingly ill-fitting measure, serving none of its purposes as well as it used to. We are at the uncomfortable point of recognizing its shortcomings without having any consensus among either users of GDP or economists and statisticians about what might replace it—or even whether there should be a single headline measure of the economy, or a dashboard of measures, just as a well-run company would never rely on a single key performance indicator (KPI). It is almost a century since the economic profession debated to any extent the question of economic measurement; economists simply download the latest GDP figures without thinking about them, rarely even checking their conclusions when the data are revised, as they always are. It is time for economists to think seriously about measurement again. The creation of GDP, and its development as an international standard, was the work of a decade or more. It will take as long to create its successor. Careful study of the effects of new technologies will be a vital part of the work. But so too will be debate about the purpose of measuring the economy, and if what we want is a broad measure of economic welfare, what that means for a prosperous and innovative (but unequal and resource-intensive) economy like the United States. Diane Coyle is a Professor of Economics at the University of Manchester, England, and author of GDP: A Brief But Affectionate History. The views expressed here are those of the author and do not necessarily reflect those of the U.S. Chamber of Commerce Foundation, U.S. Chamber of Commerce, or their affiliates. [i] David Landes, The Wealth and Poverty of Nations: Why Some Are So Rich and Some So Poor (W.W. Norton, 1998). [ii] Robert Gordon, “The Demise of U.S. Economic Growth: Restatement, Rebuttal, and Reflections,” NBER Working Paper 19895, February 2014. [iii] Historian Paul David set out this argument with regard to electrification in “The Dynamo and the Computer: An Historical Perspective on the Modern Productivity Paradox,” The American Economic Review, 80, no. 2 (1990): 355-361. [iv] Leonard Nakamura and Rachel Soloveichik, “Valuing ‘Free’ Media across Countries in GDP,” Federal Reserve Bank of Philadelphia Working Paper No. 15-25, July 2015. [v] Barry Schwartz, The Paradox of Choice: Why More is Less (Harper Perennial, 2004). [vi] See, Cesar Hidalgo, Why Information Grows: The Evolution of Order from Atoms to Economies (Basic Books, 2015). [vii] See, Susan N. Houseman and Michael Mandel, eds., Measuring Globalization: Better Trade Statistics for Better Policy (Kalamazoo, MI: W.E. 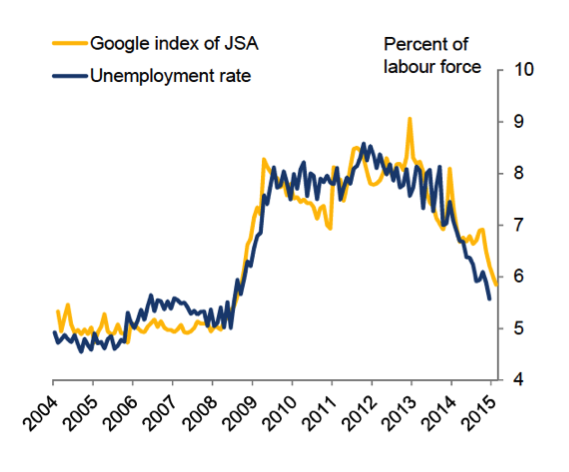 Upjohn Institute for Employment Research, 2015). [viii] Diane Coyle, “Talking about the National Accounts: Statistics and the Democratic Conversation,” University of Manchester Economics Discussion Paper Series EDP-1506, May 2015. [ix] Mark Skousen, “At Last, a Better Economic Measure,” Wall Street Journal, April 22, 2014. [x] N. McLaren and R. Shanbhogue, “Using internet search data as economic indicators,” Bank of England Quarterly Bulletin, 51, no. 2 (2011): 134-40. [i] The BEA included $690 billion of “intellectual property investment” in 2014’s GDP figure. [ii] William Baumol, The Free Market Innovation Machine: Analyzing the Growth Miracle of Capitalism (Princeton University Press, 2002).